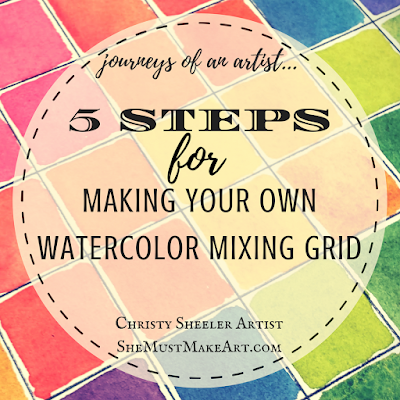 I use mixing grids as tools, because it saves so much guesswork. Clearly seeing which mixes I want to use in my work, I am less frustrated and make fewer mistakes. It's less, "oh, I don't like that!" There's more "oh, it's coming together!" Would you like to make one? Does it seem intimidating? Can I give you some tips to get you started? It's an enjoyable process, methodical yet relaxing at the same time. In the past, artists have shown interest in making a chart like this. It's just paper and paint. Really. I promise. Don't hold back because I'm just sure you can handle it. 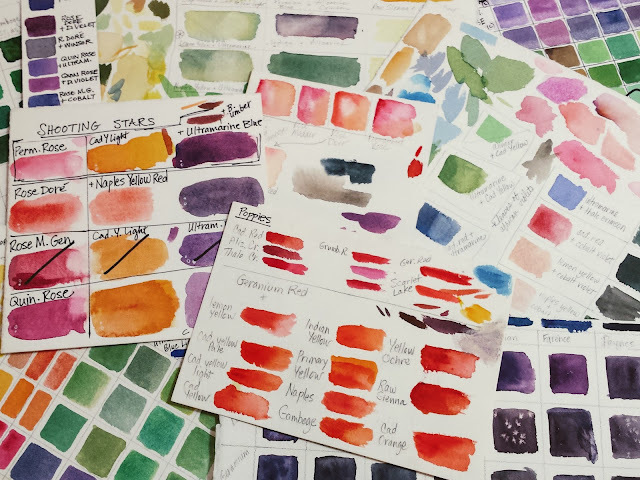 After the many years I've painting with watercolors, there's a stack of various watercolor paper scraps with free form brushstrokes of color. Each one of these pages is a record of my time exploring how to achieve a certain mix for a painting. 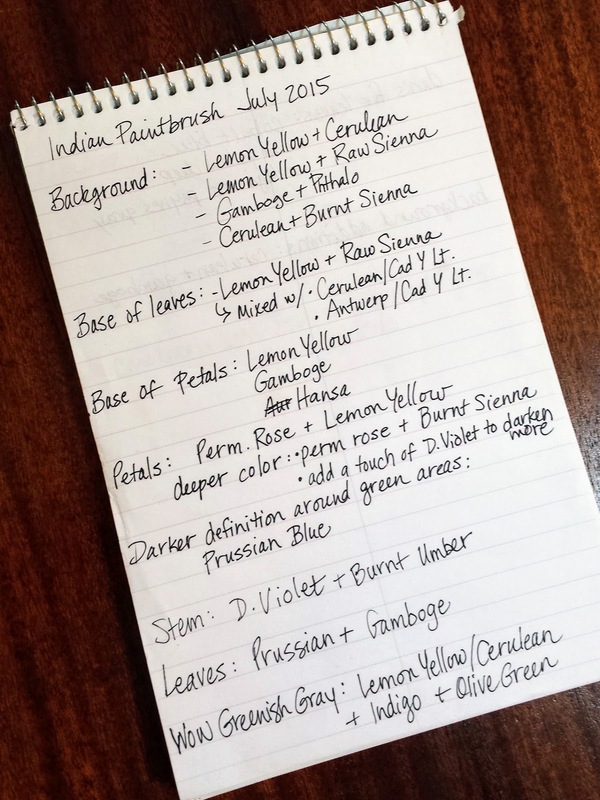 The earliest mixing "notes" are filled with blobs of color with a few scribbled notes in my handwriting. I sorted this stack into the following collections. Some of them instantly take me back to the specific painting, others not so much. It's interesting to see how my methods changed over time. Keep the number limited. 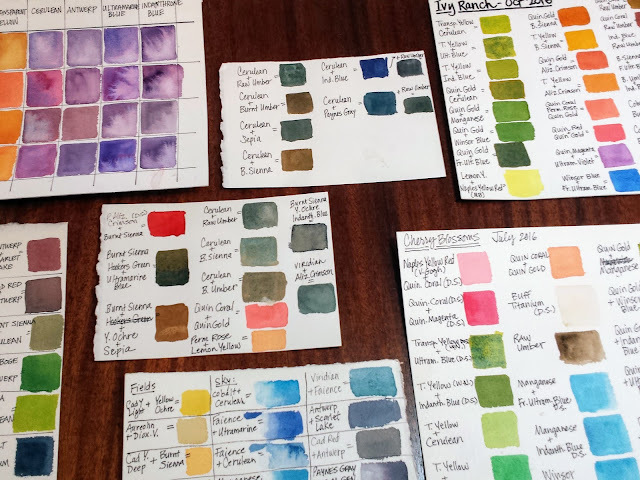 How about the primaries, and then a few other pigments you're curious about trying out. 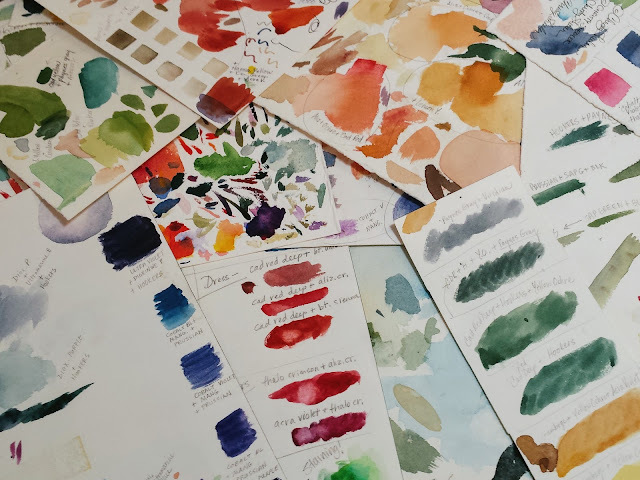 I usually begin by comparing my reference photo with my favorite reference book, The Watercolor Painter's Pocket Palette by Moira Clinch. 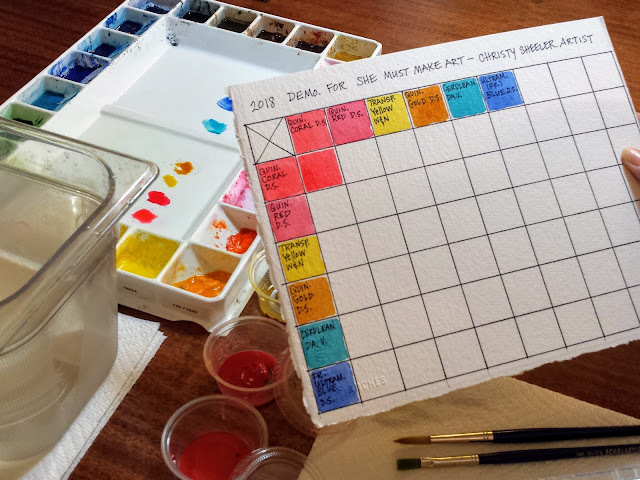 Over time, I have saved my mixing grids from previous artworks, and those are also great tools now. 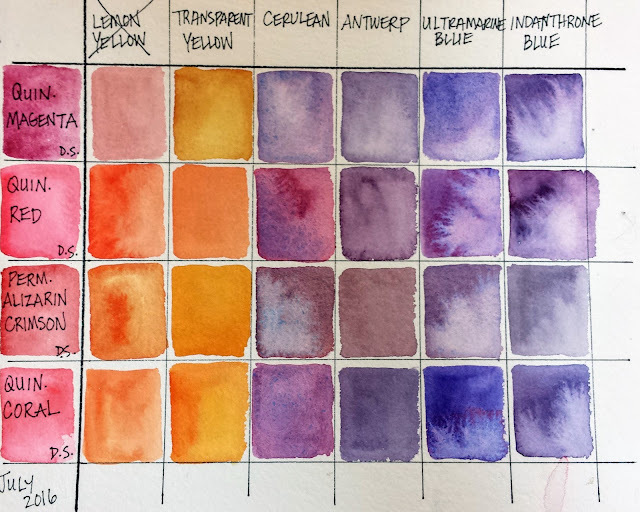 So, for the hollyhocks as my photo reference, I've chosen these watercolor pigments. 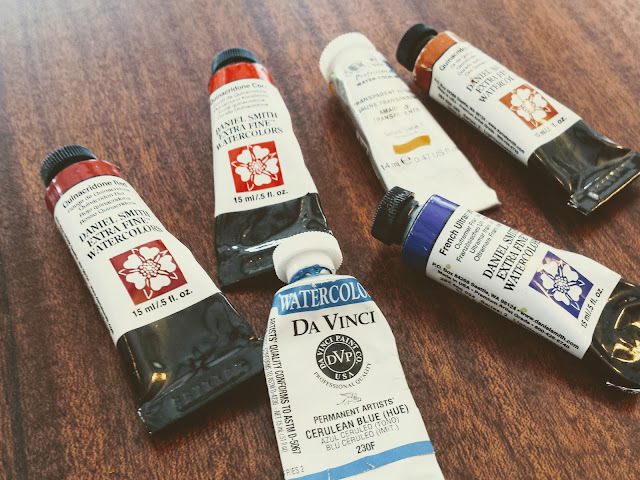 I chose Daniel Smith Quinacridone Coral, Daniel Smith Quinacridone Red, Windsor & Newton Transparent Yellow, Daniel Smith Quinacridone Gold, Da Vinci Cerulean Blue, and Daniel Smith French Ultramarine. 2. 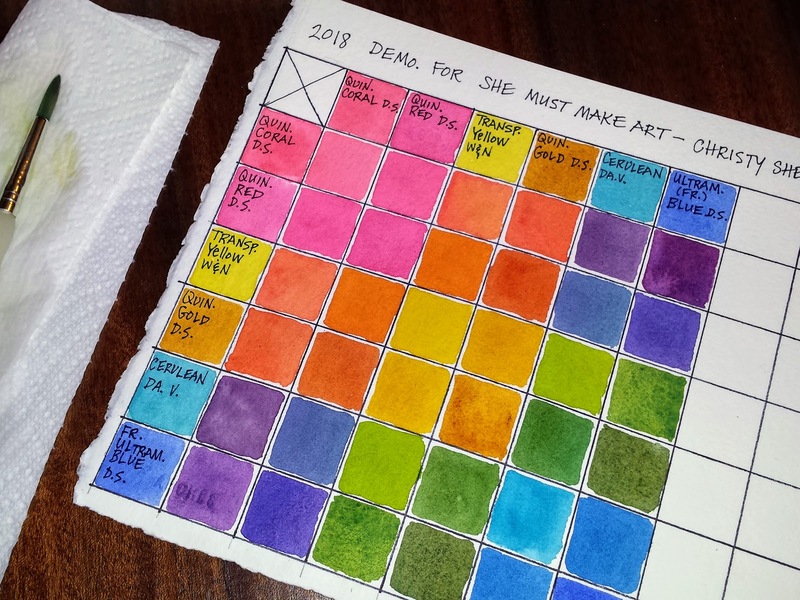 Draw grid on watercolor paper. 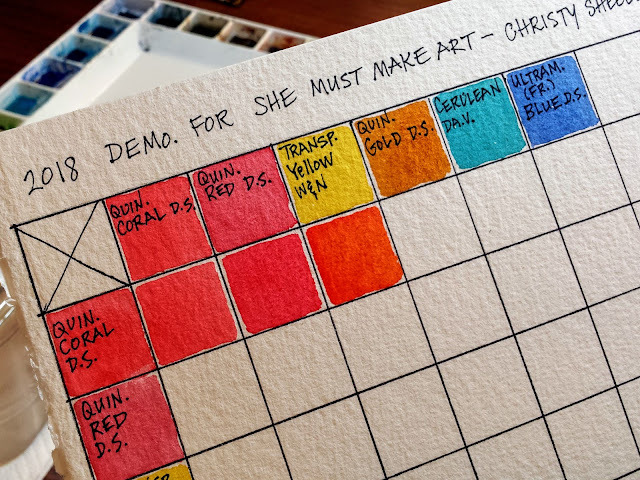 Use the same weight and type of watercolor paper as you plan to create your artwork on later. This gives you a more accurate guide as a result. 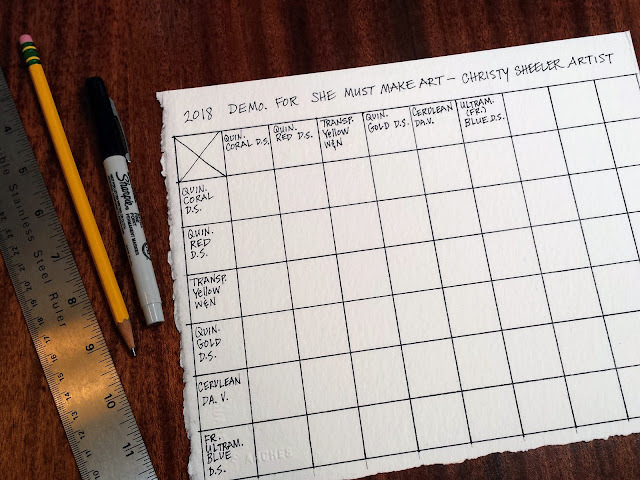 I use a sheet measuring about 8" x 10" and draw a grid. 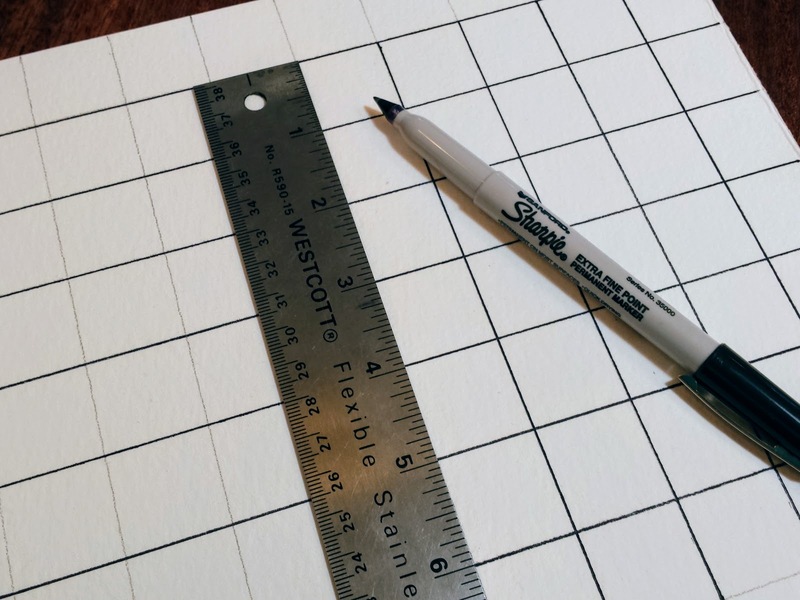 With a straight edged ruler, I measure off 1" tick marks to create the grid with a pencil. Then I go over the lines of the grid with a fine point permanent marker. Be sure to use a permanent marker; the ink will not bleed as the paper gets wet. I like having the individual squares at least 1" square in size. As you try this, you'll find what size is best for you. I also like to note somewhere the date and if there's a specific subject in mind. This has helped me quickly locate a grid reference much easier in the past. 3. Label grid with pigments you've chosen. There are many ways you can do this. I key into the pigments I am most interested in for planning my artwork. Place all the yellow or the pink or the blues down the first column on the left side and label them. (At this point, you can lay your tubes on the squares to help think through which mixes you're wanting to explore.) 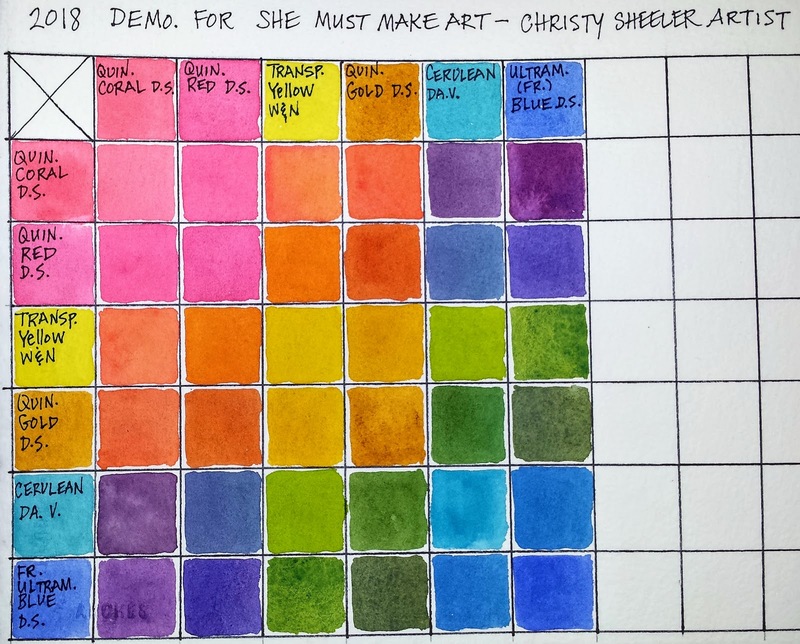 Across the top row, label the pigments for your mixes. If a pigment, like transparent yellow is labeled on the left vertical column AND the top horizontal column...that is just fine. That one square where they meet will be filled with pure transparent yellow. If any of this is beyond confusing...just hang on. It will make more sense soon. Added note: If you have a large collection of pigments by different companies, be sure to label that as well. Is this the transparent yellow by Windsor & Newton or Daniel Smith? Pigments vary from one company to another and you'll need that information later. Note: The watercolor pigment should be squeezed from tubes into individual sections of the palette or into small plastic condiment cups with lids. Amazon sells 125 cups for about $8 here. Label the pigments on palette edge or on lids with fine point permanent marker. I am using paint in the plastic cups for this demonstration. Several of the pigments are not on my regular palette. I have more pigments than can fit on the palette. Use your synthetic brushes and leave your expensive brushes to rest. This mixing and rinsing can be hard on the nicer sable brushes. Synthetics can take the abuse better and they are more affordable to replace sooner. 5. Begin to mix and create the watercolor grid. 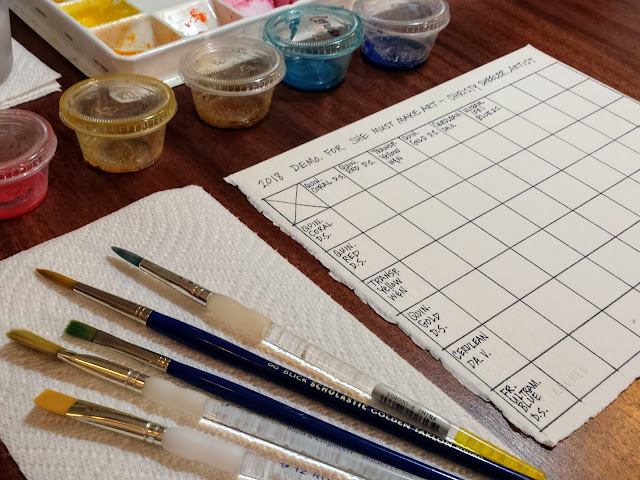 To begin, the pigments to be added to the squares that are labeled on the grid. This is just pure color with no mixing yet. This is a visual cue of what that pigment is by itself. I fill in like this down the first vertical and first horizontal row. Important tip: Do NOT let the color in one square touch the color in another square while wet. Watercolor's nature is to move into wet areas. Leave a small bit of white border so the colors will not bleed to the neighboring squares. Now, I can begin mixing pigments. Well, almost. Watch carefully now because certain squares will be pure pigment without mixing. In row 2, square 2...notice it's pure pigment, Quin. Coral. 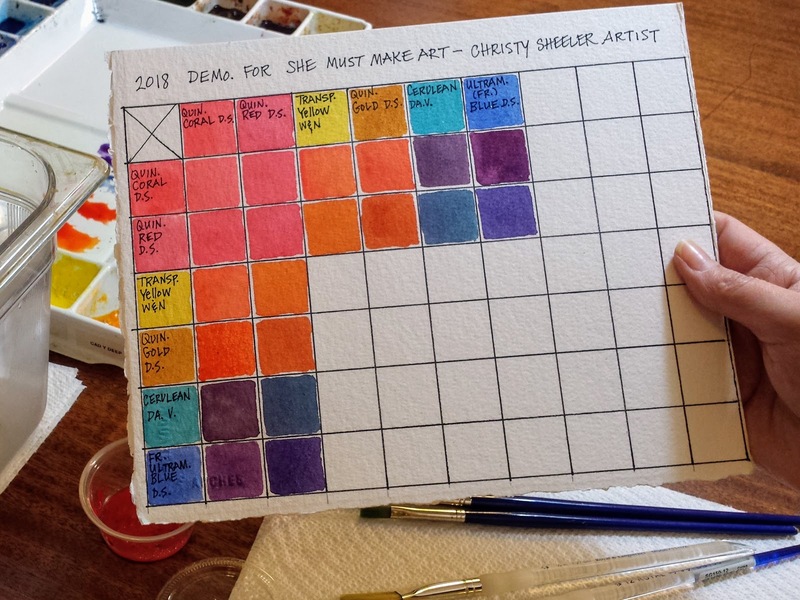 In row 2 square 3, I begin to mix the pigments that lead from the outside to that square. If it helps, draw your fingers from the outside to the inside and the square where they meet, you'll mix on the palette and apply the resulting mix to that square. 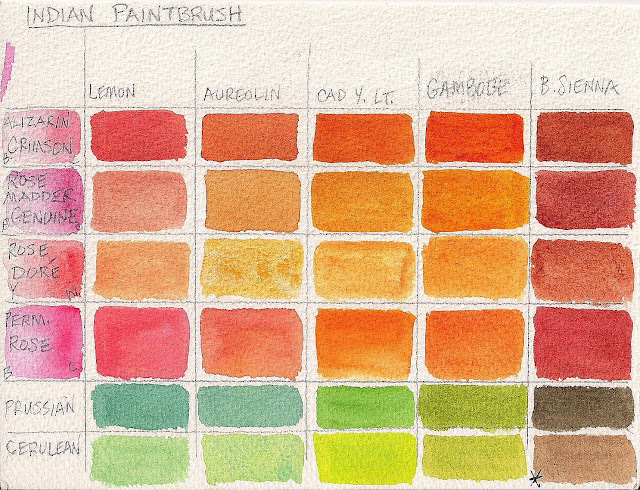 How you mix the two pigments, in equal or unequal proportions, is up to you. If it's a green you'd like for leaves and a more yellow hinting green is what you want, then mix it and record it that way. 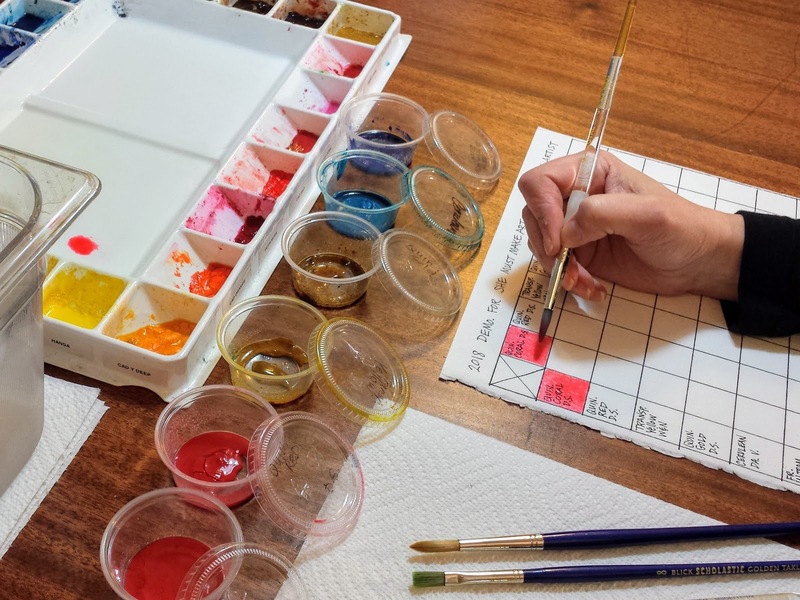 Each mixture of pigments can be bolder by using more pigment and less water. If it's a more pale effect you're after, then add more water to the mixture until it's what suits you. Two rows completed both across and down. See the repeat? 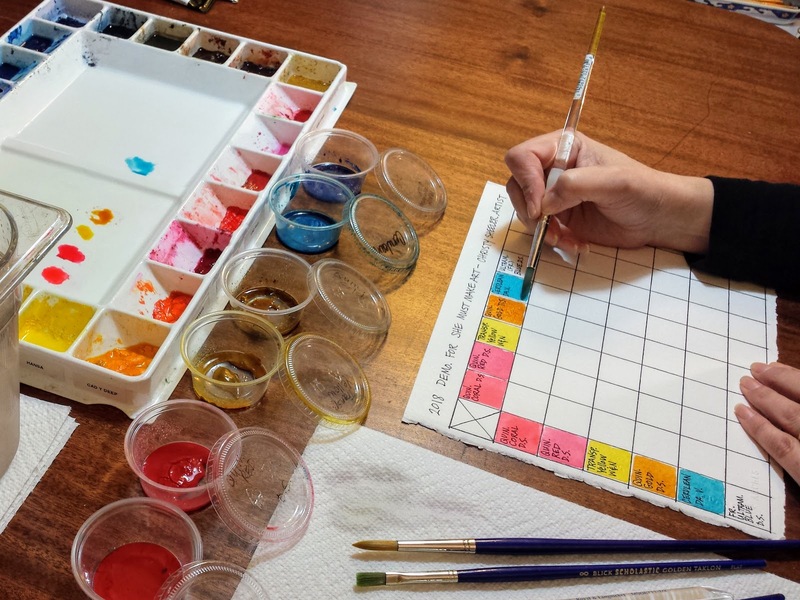 The color mixing grid is completed. If I'm having a difficult time choosing which of several similar pigments to use in my project, the grid makes it more clear for me. 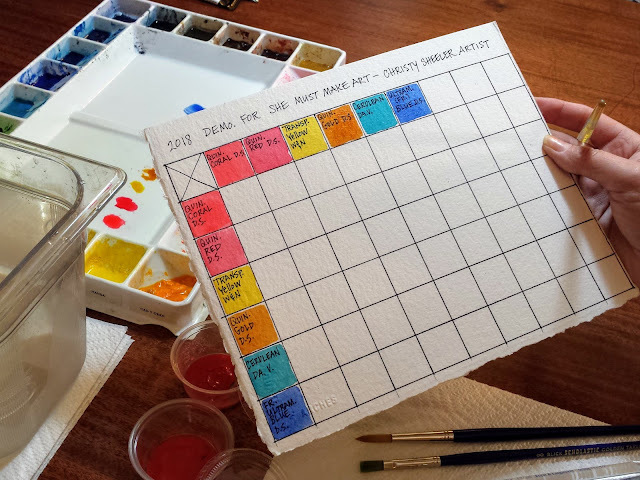 A mixing grid like the one below has all variations of red as main pigments. If I'm questioning whether to use Quin. Magenta or Quin. Red, I'll look over the resulting mixes and see which I'm more excited about for the mood/inspiration within my art reference photo. This may seem like a lot of work as preparation for a painting but it's time well spent for me. Not every artist will be drawn to these methods. Many artists choose to let the paint mix on the paper's surface in a more fluid and unpredictable way. My one thought is that these mixing grids help me understand what to expect when the pigments meet each other. 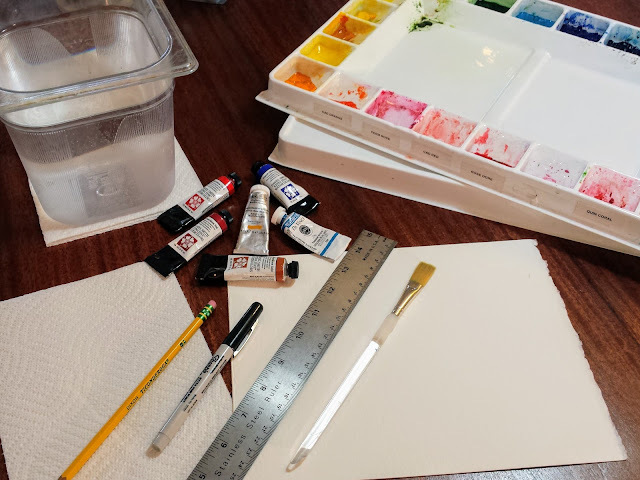 Whether it's premixed on the palette or directly mixing on the paper, I am avoiding dirty mud like color results. 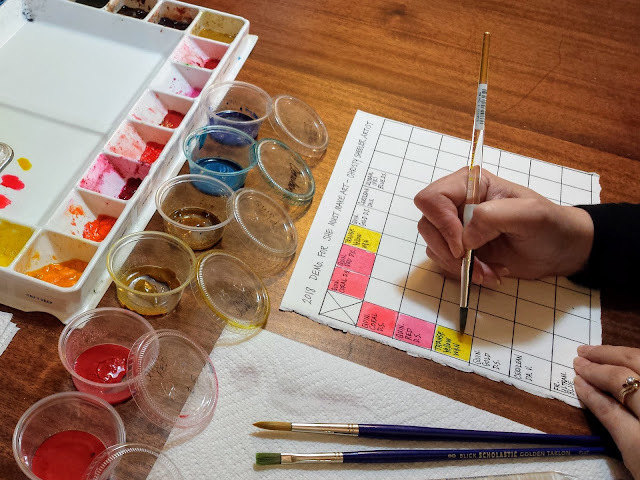 All this mixing helps an artist better understand the character of the individual pigments. The pigments do not all perform the same. One pigment will spread nicely and evenly. Another will spread actively and granulate as it dries. Another pigment will stain, predictably difficult to lift. Some mixes still show a hint of the individual pigments used to create them. The pigments have a life of their own. They are not easily tamed or mastered. That's why some artists avoid watercolor and others can't stay away because they love the adventure of it. 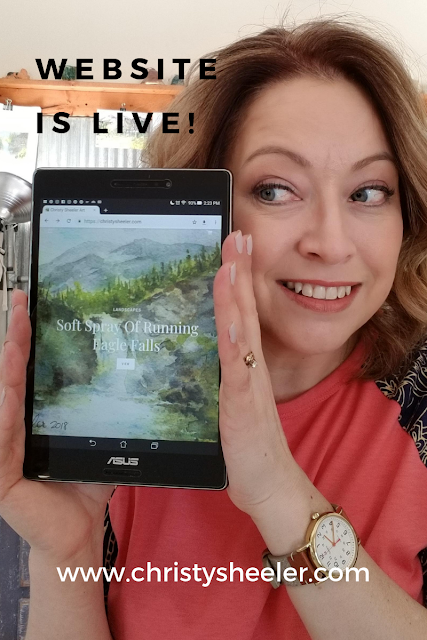 What happens when the painting is going really well? It's coming together with such ease. The painting is not quite finished. 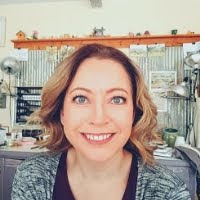 You were in that creative place, feeling so connected with the process but then there's some sort of interruption. An interruption can last quite a while. There are times when we think it will be just a few hours or a few days. Then it becomes months. When the time is finally right and you can return to complete this artwork...then what? 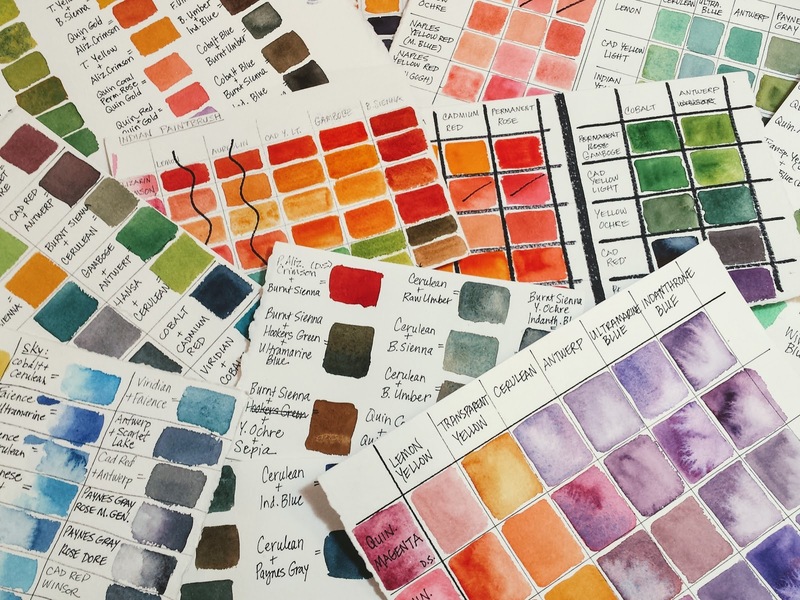 How do you remember the pigments and the mixes? Is there some record of your color recipes? Believe me. It happens. So maybe in whatever form suits you, it is something you might want to try. It's hard enough to get back to the creative space after a long pause. 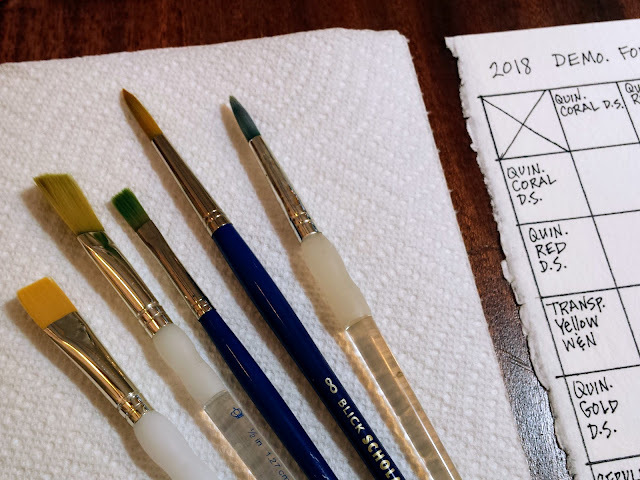 Play with mixing some watercolors, put it on paper, and label it...with the pigments used, the date, and what you are working on at the time. P.S. 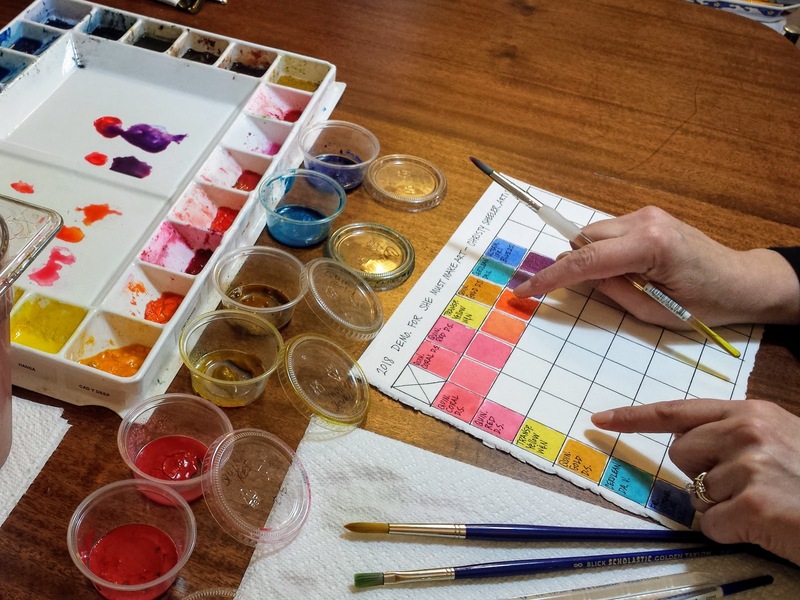 A short little video of my color mixing in action.